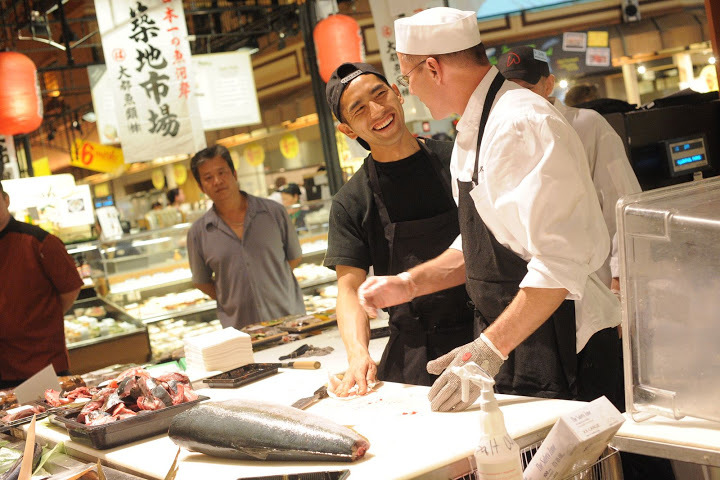 Tokyo food tours led by a chef, sommelier, shōchū advisor, and a Japanese fishmonger. Interpreting from Japanese to English for food related events, market tours, cookbooks, websites. Interpreting services for English speaking food professionals (retail and restaurants) visiting Japan. Depachika tours that deconstruct the massive food halls by Yukari, a former employee of one of Tokyo’s most famous depachika. Supermarket tours to learn about Japanese ingredients. Appearing in food and saké travel programs and interpreting services for food and beverage journalists. Born in Tokyo and raised on the shores of Lake Wobegon, Yukari Sakamoto trained as a chef and baker at the French Culinary Institute. Following that she trained as a sommelier at The American Sommelier Association and worked as a sommelier at the New York Bar and Grill in the Park Hyatt Tokyo. 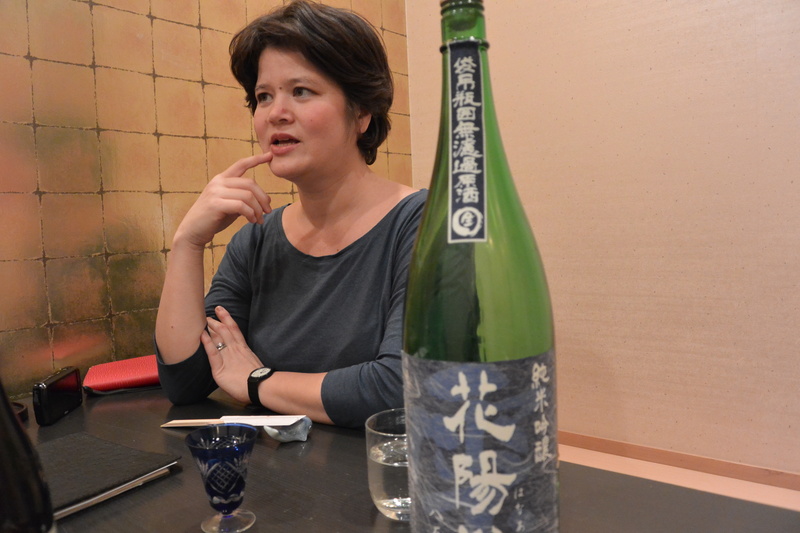 She also worked at Takashimaya’s flagship store in Nihonbashi as a sommelier in the saké department of the depachika. While at Takashimaya she passed the exam to be a shōchū advisor. Shōchū is a distilled spirit native to Japan. Yukari apprenticed at Coco Farm and Winery in Ashikaga, Tochigi. Yukari also offers market tours with Elizabeth Andoh’s Taste of Culture. 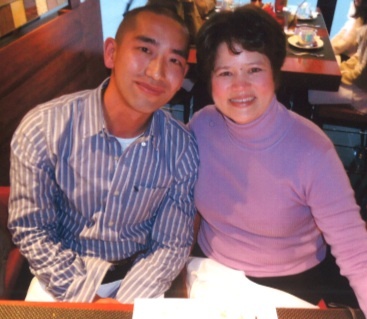 Yukari’s writing can be found in Food & Wine, Saveur, The Japan Times, and several other publications. She is a regular contributor to Metropolis magazine in Tokyo. Yukari is married to Shinji Sakamoto, a former buyer at Tsukiji Market. Shinji has ten years’ retail experience in Japan selling seasonal seafood directly to customers. He would make cooking recommendations and cut up seasonal fish as the customer needed. He also has three years’ experience selling seasonal Japanese seafood and frozen seafood in both New York City and Singapore. 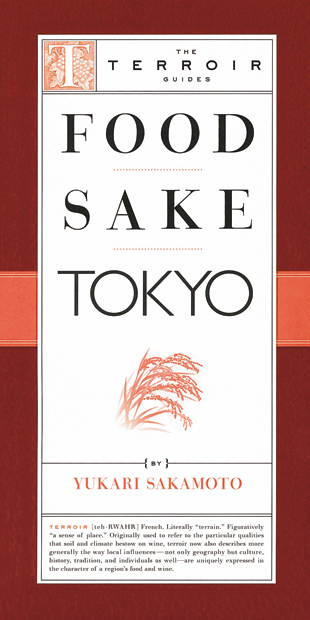 Yukari’s first book, Food Sake Tokyo, is published by The Little Bookroom as a part of the Terroir Guides. It is a food lover’s guide to Japanese food and beverages and introduces restaurants and food shops in Tokyo. There is also a chapter on Kyoto’s Nishiki Market. The first half of the book focuses on the food and beverages of Japan. The second half selects some of Tokyo’s popular destinations by station and suggests shops not to be missed in that area. Any changes to information in Food Sake Tokyo, that I am aware of, will be posted on this blog. Please search under “updates” for the most recent PDF that you can print out. Our other blog focuses on cooking Japanese food at home. Contact: yukari dot shinji dot sakamoto at gmail dot com. Please let us know what dates you are interested in when contacting us. GENERAL CANCELLATION POLICY: Should Food Sake Tokyo need to cancel any or all segments of a program, every effort will be made to re-schedule sessions at a mutually convenient time. If that is not possible, a full refund will be made promptly for sessions canceled by Food Sake Tokyo. If an individual or group is unable to attend a Food Sake Tokyo program for which they have already enrolled, that person or group may designate a substitute for him/her/them. No additional fees are charged to the participant (substitute attendee). Any financial arrangements made between the original participant and his/her/their substitute is at the discretion of the person originally enrolled. All requests to have a substitute attend a program, however, must be received by phone or e-mail at least 24 hours prior to the scheduled class meeting. When making such a request, please provide the full name and (local, Tokyo) contact phone number and e-mail address of each person who will be taking the place of the originally enrolled individual or group. Once an individual or group has paid for a program it can not be refunded. LIMITATIONS on LIABILITY: Every possible precaution is taken to ensure your personal safety and the safety of those in your group. However, registration for, and attendance at, all programs is subject to the following condition: the director and staff of Food Sake Tokyo, are released from, and specifically disclaim, all responsibilities for injuries or illness incurred traveling to and from sessions, during sessions, or resulting from food prepared at, or according to recipes distributed during, cooking & tasting sessions, market tours or other field trips, including restaurant meals. NOTE: Tuition fees for cooking workshops, market tours, and other field trips conducted by Food Sake Tokyo do NOT INCLUDE food & beverage not specifically mentioned in the program description. Tuition does NOT include the cost of local transportation. Any purchases made by participants during class, market tours or field trips are at the discretion of each participant. Participants in all programs are responsible for making arrangements for, and making payment for, their airfare, lodgings, and transportation to/from/within Japan. Participants are also responsible for obtaining and paying for any travel/trip/health insurance coverage they would like to have. © Yukari Sakamoto and Food Sake Tokyo, 2009-2015. Unauthorized use and/or duplication of this material without express and written permission from this site’s author and/or owner is strictly prohibited. Excerpts and links may be used, only after I have agreed to it. I was happy to read that you enjoy trips to Mashiko and that you love food. I am a Canadian living in Mashiko. I have just recently created a web site about restaurants in Mashiko aimed at foreigners coming here to enjoy the town. As you may have found, there is a lack of information about Mashiko for foreigners despite the fact that it is internationally famous for pottery, and many people like you come here to check it out. I thought that I should do my part to make visitors time here more enjoyable, if possible. Please take a look at my site and if you think that it would be useful to people visiting Mashiko, I would appreciate it if you would add it to your links. You are so lucky to be living in Mashiko. I can only imagine the different pottery you have picked up over time. Yukari-this is simply an amazing guide! It is so detailed, helpful addresses, tel numbers, great photographs and descriptors -why don’t you create a guide book for Kappabashi! I also recently found a Paris foodie website which is run by a person who offers culinary tours of the city – is that something that you could do for foodies who visit Tokyo? Thanks so much for a great site-looking forward to more! Thanks for your kind words. My book on food shops in Tokyo is coming out later this spring/early summer. It will have a guide to Kappabashi and twelve other neighborhoods in Tokyo. I do tours of Tsukiji, Kappabashi, and depachika. Look forward to when our paths cross next. I think we last met at a FEW meeting in Tokyo. I just found your blog, and it’s great! I live in Gifu, in a town called Gujo Hachiman, and I plan to visit Gero soon. I write about food and culture in Japan as well. Maybe we can collaborate some time. We also have the same last name, which blows my mind. Would like to congratulate you on your great new book Food Sake Tokyo – I wish I had had it with me on my recent research trip to Tokyo to update my Rough Guides to Japan and Tokyo – I’m planning on including a short review of it in the new editions of the guides and am interested to read that you also conduct culinary tours of the city – if you send me details of how people may arrange these with you I can add that to the section we have in the Tokyo guide about learning more about Japanese cuisine. My family (two daughters and my wife) will be in Japan later this month, and your book was a tremendous find! It led to this great blog too with great pictures and descriptions. We are foodies here in the San Francisco area, and it is so nice to have this guide so that we can get the best of food in Tokyo. The book is extremely well written! Thanks again! Just got the book it looks fantastic! Can’t wait to really dive into it. The photos have a beautiful color quality reminiscent of kodak or printing in the sixties, I love it. I’m also glad to hear you think Isetan shinjuku is the best depachika because my girlfriend and I were floored when we went there, I’m going to guess that maybe one of the worlds greatest grocer/food department store. My wife and I will be in Tokyo in February 2011 (a good time to be out of Canada!). As we found your book immensely informative, we were thrilled to read that you offer guided tours of the Tsukiji market and depachika. As we found no other way of contacting you directly, we were wondering whether you could respond to the Email address provided with this comment. At any event, congratulations on publishing such a fantastic guidebook on one of the culinary capitals of the world. Hello Yukari, first of all I want to thank you for your fantastic blog, it is really helpful and very very interesting. I am looking for “matcha” specialists in Tokyo, a place where I can learn to make Japanese sweets with “matcha” (it can be a school, a shop or any other place). Any recommendation? I just bought your book and I am so excited to devour it! I’m coming to Tokyo in March 2011 to visit a friend, so I can’t wait to see (and eat) what you suggest. I am also interested in the tours, if possible. Thanks! Even a seasoned Tokyo hand like me, (I have lived in Japan for a total of 10 years over the last 38) found wonderful new places to go and delicious food to eat. Some of the stores and restaurants that you mention have been my favorites for years – I just saw them in a new light. I have suggested to many of my Japanese friends that they get this book too as there are plenty of spots they are unfamiliar with. One friend, a real Edo-ko took me to lunch at Yoshikami, famous for Japanese style Western food – and there is was in your book, perfectly described. I am visiting Tokyo in October (2011). Do you know if it is possible to find any japanese cooking classes for one day/half a day? Just got back from a two week trip to Tokyo and Kyoto. My wife and I used your book the whole time in Tokyo. It was invaluable. The recommendations were great and so were the directions. It was surprisingly hard to find places in Tokyo even with GPS and maps. Our friends who lived there also liked it and bought a copy for themselves. We’re looking forward to going back. hi Yukari, I jus started reading Food Sake Tokyo because I’m planning a trip to Tokoyo and other parts of Japan in Sept. I was wondering if it’s possible to arrange a special tour with you? If so, please let me know how I can set this up. Arigato for your note. I’ll e-mail you directly. Thanks for getting Food Sake Tokyo. I hope you enjoy it and that it serves you well on your trip. Hi Yukari, just like Teddy, I too have started reading your Tokyo guide, devoured your website, and was wondering if you are available in mid-September for a day tour of Tokyo markets, foods, recommended hidden gems or whatever you find appealing at the moment + a must for a Tokyo newbie? I know this is only a month away, but if there’s any possibility, I’d be delighted to meet up with you. I’m so glad to have stumbled onto your blog. I’ve spent so much time here today and am going to rush out and get your book. I’m planning my husband’s 40th birthday in Tokyo, the weekend of Nov 9th with a small group of close friends and it would be fantastic if you would be available for a sake/sochu/food/market tour. Everyone in the group loves food and it would be fantastic to meet you. Will be in Tokyo in late June, 2013, and would like to schedule a tour to Tskukiji. Schedule permitting, Isetan Shinjuku, and a cooking class. Your book sounds terrific. I have landed in Japan and here for a week (until 30th) visiting a friend who’s just moved here. I have read your book back to back and fallen in move with the intricacies of the cuisine. I was hoping you could do a tour kind of like bobs with me (happy to combine with other people). My friend has a young baby so would probably only want to join on certain sections eg the super market. I know it’s slightly disorganised not to have booked but I’ve been working very hard and it wasn’t until I landed that I realised quite how different the menus and supermarkets are and that I was craving to learn more about what I was eating. Hello I recently discovered your excellent blog while doing research for my husband’s birthday gift (shochu related). While we are winding down our 1 year here in Japan (how I wish I’d found your blog sooner! ), I’d love to set up a shochu class before we leave so that we can learn more. We loved having your book for the trip we took to Japan in April last year. 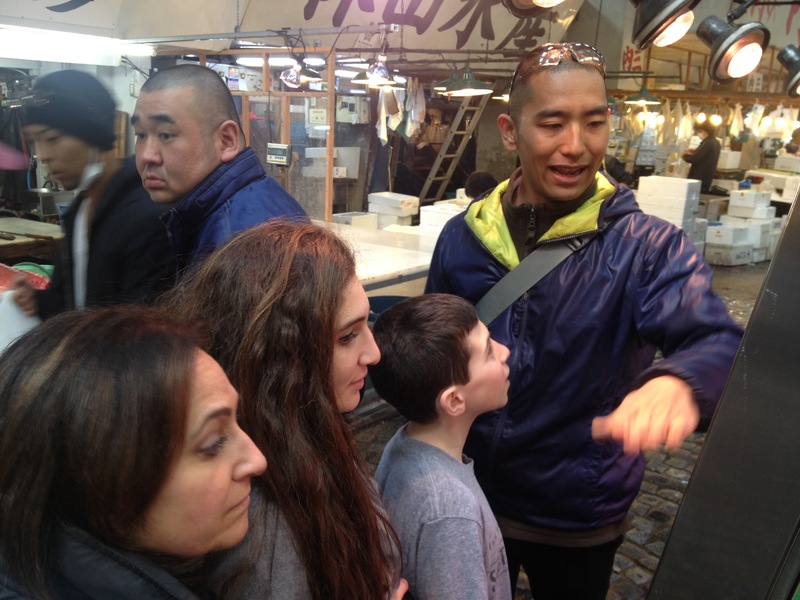 Since then, we have enjoyed your blog and as we prepare for another trip this coming October, we would love to take the Tsukiji Market tour with you then. Please advise us as to how we can enroll in that. Yukari, I’ve just read your book cover to cover on the plane to Tokyo from San Francisco and it presents such a wealth of cultural knowledge with warmth. Would love to coordinate a tour this week if possible. I love your blog! Me and a friend of mine are coming around late January. Would love to get a tour from you. can you please let me know if you’re free, how much it is, how long it’s for and a rough itinerary? I tried to reply to your e-mail Tina, but it came back as undeliverable. Please contact me directly. Our e-mail is on the “about” section on this site.